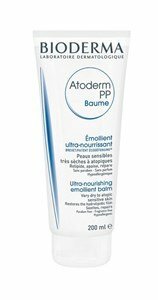 Atoderm PP Emollient Balm is the 1st bio-reparator daily care of dry to very dry atopic skin, subject to irritations. 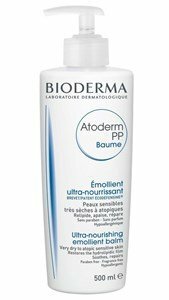 Thanks to a unique and innovative formula, Atoderm PP stimulates the natural process of skin barrier reparation, by increasing the production of B-defensins, which regulates the flora. Formulated with vitamin PP to 2%, stimulates skin cells to synthesize lipid components (ceramides, cholesterol and free fatty acids), necessary for the cohesion of the cement intercorneocitário. The presence of Zanthalene, gives a anti-prurigin action, giving comfort and relieving the skin. Atoderm PP Balm emollient, restores the skin and gives a comfortable level of hydration. Apply Emollient Balm PP Atoderm, 1 or 2 times per day on clean skin, after using the Gel or Atoderm PP Moussant dermatological Soap Atoderm. Atoderm PP, is recommended in combination with and after using dermocorticoides.